March 8th is International Women’s Day, a global event celebrating the achievements of women around the world. This year the campaign focuses on the issues of inequality women still face every day. Another area where women are lagging behind is personal fitness. 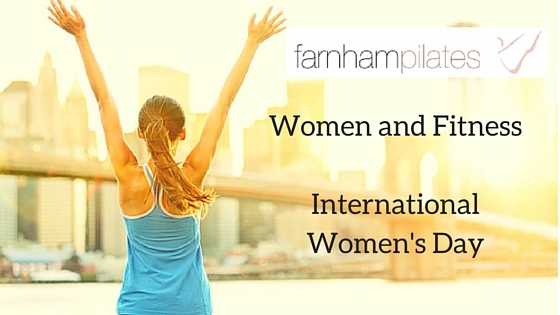 Studies have shown that women are up to 50% less likely to participate in sports and physical exercise than men. Research shows just 1/6 women has exercised regularly since childhood compared to 1/3 men. Women often fall way down the list of priorities in their own lives and struggle to find time to work out. Family often comes first, followed by busy work schedules. It’s all too easy to say I’ll do it tomorrow. Regular exercise has so many physical and psychological benefits. For example Pilates can help your alignment, posture, release tension in joints and improve your performance in all sports and can help relieve your back pain. I think we should use this day to encourage and inspire other women to have the life they deserve and show that anything is possible if we work hard and help each other. Saturday 27th February 8-12pm – Curry and drinks at Hannah’s, Tickets are £20 and include welcome drink and Thai curry. Friday 4th March 4-6pm – Children’s Disco in Rowledge Village Hall (aimed at primary school age children up to year 7 but all ages welcome). Tickets are £7.50 which includes a drink and party food. Friday 15th April 8 till late – Mixed gender poker night at Hannah’s house. It’s £10 to play. You can bring your own booze or there will be an honesty bar to raise money. Friday 22nd April 1-3pm Coffee afternoon at Becky’s house (21 Lickfolds Road.) Just come along for coffee and cake and donate money on the day.